This is a pure pedal assist bike (pedelec); there is no throttle option. So that means you have to be pedaling 🙂 There are 4 levels of pedal assist in addition to a zero assist and a Re-gen mode. The Re-gen mode turns the motor into a generator and recharges the battery. Re-gen is handy for a long down hills or if you really want to get a workout! The Re-gen mode is automatically activated when the rear brake lever is engaged; that is considered regenerative braking. The battery is integrated into the downtube of the bike. It can be charged while it is installed on the bike or it can be removed for charging off the bike. The Turbo frame is an aluminum road style frame designed around 700c wheels. The component spec consists of a SRAM 10 speed drivetrain, Magura hydraulic disc brakes, various Specialized brand components, integrated LED lights, etc. Here is good review of the Specialized Turbo from the folks at CNET. This is an article and video from the recent Turbo launch event. And the price…….$5,900! 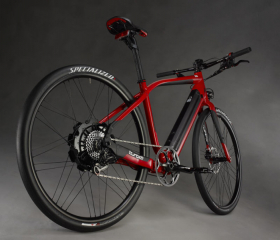 Specialized is known for going big when they first launch a new bike and then creating more economical bikes later. What do you think? Are you interested in the Specialized Turbo? Please leave your comments below. Any info on retailers who will be stocking the Turbo? I recommend that you check with your local Specialized dealer. Way too expensive for what it is, and with only a 250W motor. What is the country makeup of the frame and components? Very high-spec components on this bike. The Magura break system alone sells for around $700.00. 250w does seem low, but I’ve seen higher spec bikes that can’t get to 45k with pedal assist, so they have done some engineering. Specialized have a long history of bike design and engineering. At 21lbs, it is amazingly light for a bike that is capable of 45km. Now I’m really torn between this and Prodeco’s $5000 29er. Both bikes seem aimed at the same market: high end mountain bike spec, & light weight. Since no one is stocking either yet as far as I can find, it may be a while before good reviews come out for these bikes. I was way off on the weight above! The Turbo is 47.5lbs while the Titanio 29er is 31.8lbs. Still, both rather light bikes, but Prodeco is the clear featherweight champion. Oh, and to answer your other question, Specialezed are made in Taiwan, where, in my opinion, some of the best frames in the world are made. Yes, agreed on Taiwan bike frames. When the e-bikes get under 40#, I think more interest will be evident. Sorry the bike is way over priced and under powered. Regen braking does nothing, read https://www.ecospeed.com/regenbraking.pdf and just a selling gimmick. My City Commuter has twice the power, fenders, front and rear lights, has a throttle, five levels of petal assist, will do 25mph at $2600. Basically your report is just an Ad for Specialized. Regen DOES do something, but not too much. In Seattle, going down hills does put stuff back into the battery. I’ve seen the # of power bars on my Bionx increase that way. I just wish it could be more efficient. I see this new Specialized e-bike aimed for those with enough money to get something with the best components and panache. I’m more interested, though, in what Kalkhoff is bringing to the market. Cool looking bike, but screams, “Mug me!” then you’re out $6k. Win, loose, or draw of it’s success – Specialized is a house hold word for a domestic bicycle manufacture that has stepped up to the plate to make e-bikes. Lets face it – as established as Currie and others are – they still do not have the brand name reconition as Specialized within the domestic bicycle community. As for price ? ? There is a way to jusify most anything if the want is strong enoough. Good on Specialized for accerating the promotion of e-bikes with a celeb like Bob Roll.